Once I came to the realization that GOD truly has my best interests at heart, I finally let go of a lot (not all, mind you, I’m still a work in progress) of unnecessary baggage — worry about my future, anxiety about how to accomplish things on my to-do lists (notice the plural), fear about being accepted or rejected, concern about growing ‘older’ and physical challenges — TRUST in the One True GOD, the Creator of the universe, set my mind at ease. 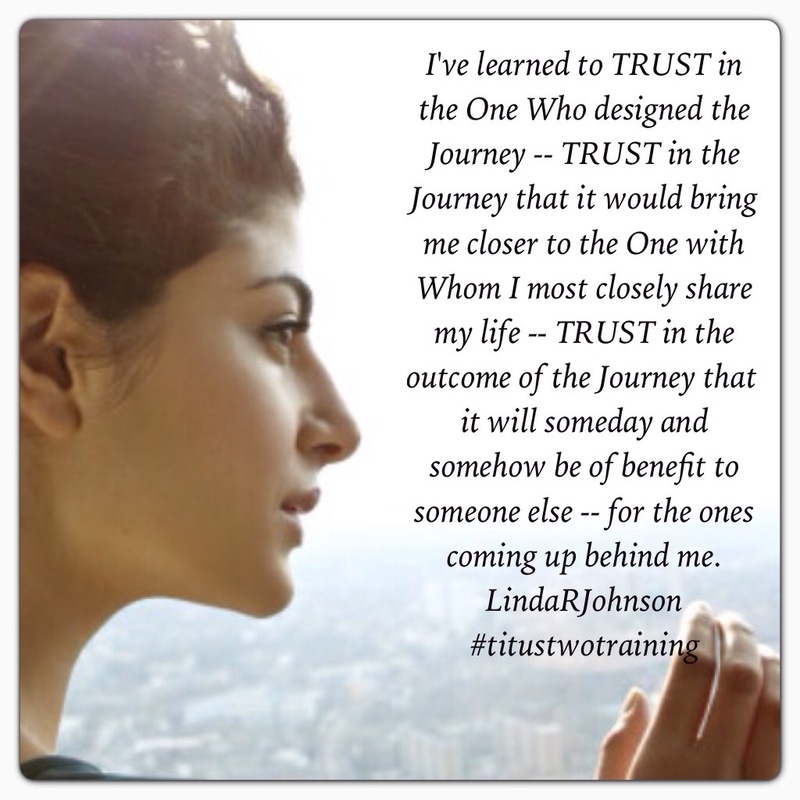 It’s not about TRUSTING Him in my human ability, but TRUSTING Him for WHO HE is — He is I AM. GOD is not who I think Him to be — He is far greater than my limited mind can imagine — He is the Alpha and the Omega. I don’t think that I will ever be able to fully grasp all of that — but I do PRAISE Him for all of that. He has proven Himself to me countless times throughout my life — and for all the times I’ve missed out on thanking Him, I bow my heart in humble repentance. I don’t ever want to miss out on the sweet opportunity to praise Him for His demonstrated love towards me. He has shown me that He can take one such as myself and redeem her for the good of those who are coming up behind her. I’ve never thought of myself as being anyone significant — just a plain ol’ gal that wants to be productive and contribute positively by impacting the tiny corner of the world that I’ve been placed. When you’ve lived a life of being ‘vertically challenged’ often times it seems as though you’re overlooked or passed up for opportunities simply because you don’t stand out. Sometimes being overlooked wasn’t so bad — especially if it took you out of your comfort zone. It was in those moments that one could never be short enough! Whenever my insecurities challenged the life outta me I always thought I was dying a thousand deaths all in a single moment. You know, that ‘meltdown’ kinda feeling. But God has been gracious to me — while He has indeed s-t-r-e-t-c-h-e-d me over the years, I must humbly admit that I’ve grown from those awkward moments of challenge. I’ve learned how to embrace being put in my place. During my teen and early adult years, I was NOT the type of person that would have said anything like this. I’m ashamed to confess that I was was one of those little people with a BIG mouth that backed it up with a strong attitude if you even looked at me funny. It all comes from feeling the need to defend oneself — largely because I felt no one would or ever did defend me. So I felt I had to do it myself. When I became a Jesus follower, I began to learn that humility was actually a virtue and not a cop out for the weak. And with a change in attitude towards myself after realizing that God valued me, I began to realize the value of others. When this took deep root inside of me, I allowed for God to put me in my place. The place where He felt that I could be of benefit to others in the greatest way with the talents and skills that He had given me along the Journey. A place where my heart melts for the woman that hurts from her past and can’t seem to recognize her relationships suffer as a result. A place where I can feel compassion for the brokenness in parental relationships and become a potential change agent. A place where a woman struggling with direction in life can feel comfortable enough to cry or reach out and I can offer her a shoulder or time to help her sort things out. A place where a sister can feel totally safe and transparent so she can unpack her baggage and find hope. Yes, God has put me in my place — and I’m glad He did — because I never would have found this place on my own. There was no sign hanging out front or neon lights flashing or a beam piercing the skies to say, ‘come here.’ No, I’ve had to listen for His whispers to lead me here — and I’ve had to learn how to step into this place carefully. I walk around this place with immense reverence and pray for God’s protection over the door posts and in the entrance way. I bless this place with praise on a daily basis. I ask for the Holy Spirit to anoint the walkway leading up to the front entrance, and all through the place. This place comes close to resembling the holy of holies — for it is IN this place that God is in action through me. In this place He stirs my soul to be an active and willing vessel of His outpouring of blessings onto others. In this place He grows me — He nurtures me — He loves me. In this place God meets me daily — confronts me — disciplines me — challenges me — to continue to reach for Him — to depend upon Him — to trust Him. In this place no two days are ever the same. And yet, my God is the same yesterday, today, and tomorrow. Circumstances change — these are the furniture in my place — but the Resident is ever Constant; He changes not. God has put me in my place, and I’m loving Him for it!